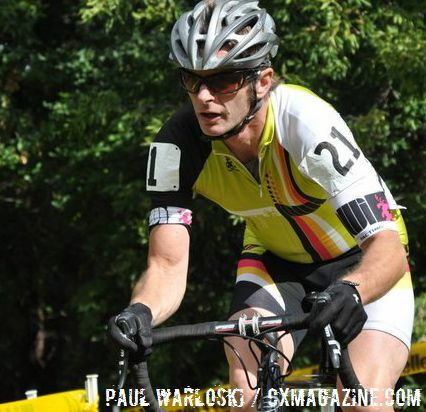 Cyclocross Magazine would like to welcome new columnist Paul Warloski, who like many of us, has a passion for cyclocross. Only for him, this passion nearly consumed his life, literally. Follow Paul as he takes us along for a ride of trials and tribulations of a cyclocrosser with a refreshed perspective. And at the same time, ’cross nearly destroyed what was left of my sanity. I have been racing on the road for 20-some years, mostly in masters categories as a cat. 4 or 3. But when I discovered ’cross five years ago, I was hooked hard. I won several races as a 4, upgraded, did well in the masters 40 plus events, and started to work on getting serious about it. In the fall of 2008, I was starting to overcome some asthma problems when I broke my collarbone in a freak crash in a ’cross race. I started training soon for the 2009 season, lifting weights, doing long base rides, and adding in some tempo. 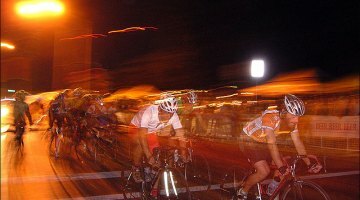 And on a long March 2009 training ride from Milwaukee around Waterford, I was 100 yards from stopping at a local gas station for a break and to call my coach to tell him how ridiculously good I was feeling already in the season. It was a beautiful, sunny day, and I was the only vehicle on the road, dressed in a red and yellow kit. Next thing I know, I was on the ground, fighting for my life. In a split second, a young man in a large pick-up truck broadsided me as he turned left into my path. I was thrown 20 to 30 feet, my shattered femur came through the skin and a hand-sized chunk of thigh skin and muscle was partially scooped out. I also broke my shoulder, tore the labrum and rotator cuff. For some reason, I saw the femur and literally tried to push it back into my skin. That didn’t work. I spent eight days in the hospital and two months away from my 7th grade students, first getting in-home therapy, then going to physical therapy three times a week. I know now I was lucky to survive. If the crash hadn’t occurred in front of a convenience store with many people there to assist me and stop the bleeding, or if the truck had been moving slightly faster, or a myriad of other what-ifs, I would have died. My friend Mike and I went later to pick up what was left of my bike. I nearly got sick when I saw it. The doctors did not expect me to walk normally again. And they cautioned me that I would likely never race my bike again. ’Cross season was coming in six months, and they told me I wouldn’t race again? I managed about six races that first year, mostly to spite the doctors and have a focus for getting through rehab, until the pain in my knee, where pins still held the titanium rod in place, grew too great as I was trying to get up the stairs at the USGP in Louisville. In 2010, though, I started to feel like a cyclocross racer again; but on some days, I grew critical of myself and upset at the lack of results, especially when I told myself I should do well at a particular course. And now the pressure was greater because I needed to be back where I was before the crash. I’ve never been good with people telling me what I can or can’t do. I worked so damn hard in PT that they told me slow down. I needed to get back on the bike. I needed to race. This column will not be the story of some kind of miraculous recovery, or a greeting card reminder of how valuable life is, or even a testament to hard work. Instead, I will be documenting a year of training: not just my body, but my mind and emotions. I will be training myself all year to work as hard as I can and race ’cross as well as I can. I will train myself to work hard to ride fast and enjoy whatever success comes my way. I will work to eliminate the expectations and the “shoulds” when I get on the bike. And that’s it. I will work to have no expectations of myself other than to race well and hard and have fun. I will work to celebrate any result, when, in the past, I would have beat myself up for not finishing on the podium. So to start 2011, I’ll write this on a card that will hang on my mirror and stay in my race bag: Cyclocross is the most fun I can have on two wheels. And thanks for reading. Drop me a comment with your hugs or hate. Paul Warloski races cyclocross for the My Wife Inc. cyclocross team in Milwaukee, Wisconsin. He is 47 and a middle school English teacher. He was nearly killed in a 2009 crash when a large pick-up truck broadsided him on a training ride. In this column, he is documenting a year learning how to be positive and content regardless of results as well as physical training. He maintains an irregular blog at http://warloski.blogspot.com. "He maintains an irregular blog at …"
Irregular doesn't begin to describe Paul. looking forward to the blog, and to racing with you again! All cyclists know that they could be hit someday but we never really think it will happen- to us. That you can ride, race even, is nothing short of a small miracle. Be thankful of what you can do and don't focus on your performance. Enjoy every race as if it is your last.